How is the industry transforming? 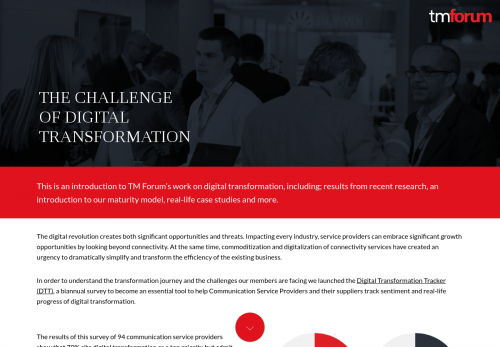 This is an introduction to TM Forum’s work on digital transformation, including; results from recent research, an introduction to our maturity model, real-life case studies and more. The digital revolution creates both significant opportunities and threats. Impacting every industry, service providers can embrace significant growth opportunities by looking beyond connectivity. At the same time, commoditization and digitalization of connectivity services have created an urgency to dramatically simplify and transform the efficiency of the existing business. In order to understand the transformation journey and the challenges our members are facing we launched the Digital Transformation Tracker (DTT), a biannual survey to become an essential tool to help Communication Service Providers and their suppliers track sentiment and real-life progress of digital transformation. The results of this survey of 94 communication service providers show that 70% cite digital transformation as a top priority but admit that they are yet to start. 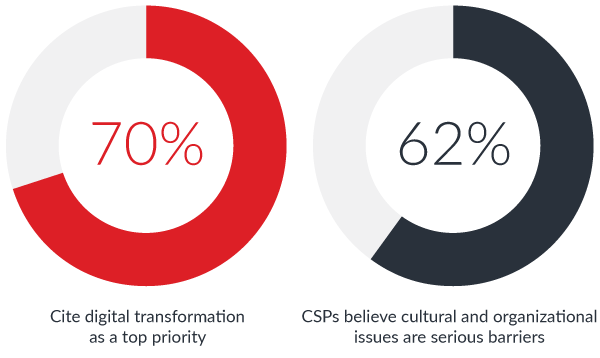 And 62% believe that cultural and organizational issues are serious barriers to digital transformation. Addressing culture and organization can be difficult, especially inside large companies that have been in business for decades. IT and software skills – Operators are working toward a business model that places much greater emphasis on software and IT skills than traditional telco operation. In its Q2 2017 results Telenor reported that it was aiming for a kr1 billion ($130 million) reduction in OpEx in 2017 through a range of initiatives including lower personnel costs, savings in sales and marketing, and operational gains. Telenor specifically cited a 15 percent year-on-year reduction in calls to call centers as adoption of the Telenor self-care app has increased. Liberty Global’s indirect cost base remained flat between the first six months of 2016 and 2017 (while revenues grew by 2 percent) as a result of the centralization of technology and IT resources, and the benefits of digital transformation more broadly.